Provident’s 5 minute Response Guarantee. If we are not at your door within 5 minutes from the time we receive your alarm signal, you don’t pay. Turn a camera into a smart motion detector. Detect a thief while he’s still only thinking of breaking in. High security doesn’t need to be ugly. In fact, it often doesn’t need to be seen at all. Lock your door, change the temperature & turn off the lights from your phone. From distributed audio and full-low voltage wiring throughout your home to our 24/7 concierge services, Provident goes well beyond security. Our Head Office and Operations Center are located in Kerrisdale at the corner of 41st Avenue and Vine Street. Since 1996, Provident Security has grown from a one-man operation providing security at high school dances to becoming one of British Columbia’s largest security firms . With a team of more than 100, and more than 10,000 installed systems, Provident provides complete electronic security installation, service, monitoring and response services as well as a full complement of security guard and consulting services. Of course, what we are most famous for is our guaranteed five-minute response service. Click here to learn about how we do it and how easy it is to get us looking after your home or business. Our Kerrisdale and Whistler teams are on duty 24 hours a day. We love to talk security and home technology. Give us a call at 604.664.1087! Provident is the ONLY security company in North America that guarantees a 5 minute alarm response time. 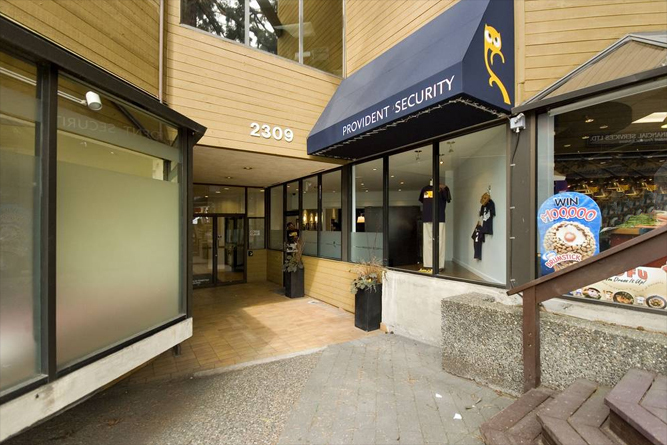 Provident is the ONLY truly full-service security firm based in Vancouver. Nothing is contracted out and all alarm monitoring happens in our 24/7 Operations Centre located in Kerrisdale. Provident is a proud community supporter. Request the Provident Slide for your next community event!